Emily Tamura learned koto from Kineya Katsuchiyo at Amache Internment Camp in Colorado. 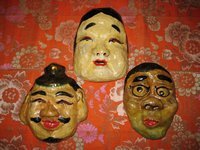 Using turnips as a base for paper mache, Enjirou Kodani made masks for Bando Mitsusa’s odori at Tule Lake InternmentCamp in Northern California. I became interested in the history of traditional Japanese performing arts practiced and performed in the American concentration camps during World War II when I heard from my mother that she learned to play the koto in these camps. She was a young girl of about 9 years old when she and her family were taken away from their home, school and work in San Mateo, California, and imprisoned at Topaz Camp in Utah, and later at Tule Lake Camp in California during the racism against Japanese Americans at that time. It was at these camps that my mom learned to play the koto. The stories of my mom and my grandparents in these camps have always struck a very deep and personal chord with me. Extensive study and research into what life was like in these camps already exists. There are ample chronicles about western music and dance that were practiced and performed, as the Japanese American prisoners used quasi prom dances and swing band performances in an attempt to lead as normal a life as one can in the isolation of the camps located in desert and swamp locations. 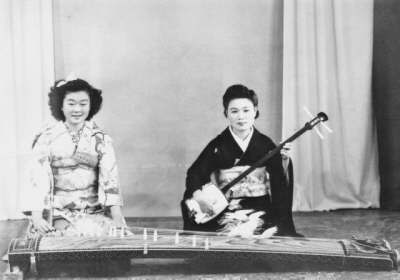 (13-stringed zither), shakuhachi (bamboo flute), shamisen (3-stringed lute), shigin (vocalization of Chinese poetry), buyo (classical Japanese dance), flower arranging, tea ceremony, and martial arts such as karate and judo – existed in the camps, there has been little documentation of this activity. The narrative of the camps was one of Americanization. Most of the history about the incarceration reflected this narrative. Japanese Americans also felt that in order to be accepted as true patriotic Americans, they would have to become as “American” as possible, which meant putting aside all culturally Japanese practices and language. The Hidden Legacy project proposes to fill some of that void and preserve for future generations the legacy of how the traditional arts survived and continued in the American concentration camps. A film documentary on this subject, “Hidden Legacy: Japanese Traditional Performing Arts in the WWII Internment Camps” was completed and released in 2014. It has been shown on public TV and PBS stations all across the U.S, in Prague, Poland and five universities in Japan. Since then, more stories and information continue to be collected by this project and other websites which chronicle the Japanese American experience during World War II. The practice and performance of traditional Japanese cultural arts and many other arts gave those incarcerated a ray of hope as well as something to do in the deserts and swamps of the camps. Classes in the arts as well as many other subjects were formed and organized to give internees a variety of activities. Even the War Relocation Authority knew that these activities were necessary to keep the prisoners occupied, otherwise they would become even more stressed, depressed and angry in this situation. The degree under which internees could practice Japanese cultural arts depended on the WRA director of each camp. Some were strict, others were more lenient. Also, because most who learned these arts for the first time did not have the proper instruments or equipment, many creatively made them, such as kimono from fabric ordered from Sears or Montgomery Ward catalogs, painted fabric designs, carved instruments out of pieces of wood and other materials, made finger picks from cow bones, used branches or paper maché flowers for arranging, mizuhiki cords from crepe paper instead of silk. The artists of traditional Japanese arts were determined to practice and teach their arts, even as doing so brought suspicion on them. Many of those who were interviewed said they did so simply because they loved the arts they practiced, and wanted them to continue. The creativity and ingenuity of the internees showed their resilience, and helped them survive in the camps. Because Japanese traditional arts continued in these camps, they were passed down after WWII within the Japanese American communities. But because the narrative coming out of the camps was strongly about assimilation, western culture and arts were preferred over traditional arts. Consequently, many of these arts are dying. It is unfortunate that traditional arts are sometimes not considered part of American arts. Immigrants who brought their arts to America are influenced by the arts of other cultures, as well, and they all become part of the American cultural quilt. Even in the countries where these arts originated from, there is a decline in their practice due to cultural globalization and things becoming more homogenous. As artisans age and die, we are losing these precious arts. We hope to encourage further dialogue about Japanese traditional art forms in the camps and allow for the discovery of other art forms that might have existed there but not covered in existing documentation. We hope this study has been and will continue to be a catalyst to continue the research on traditional arts in the camps.